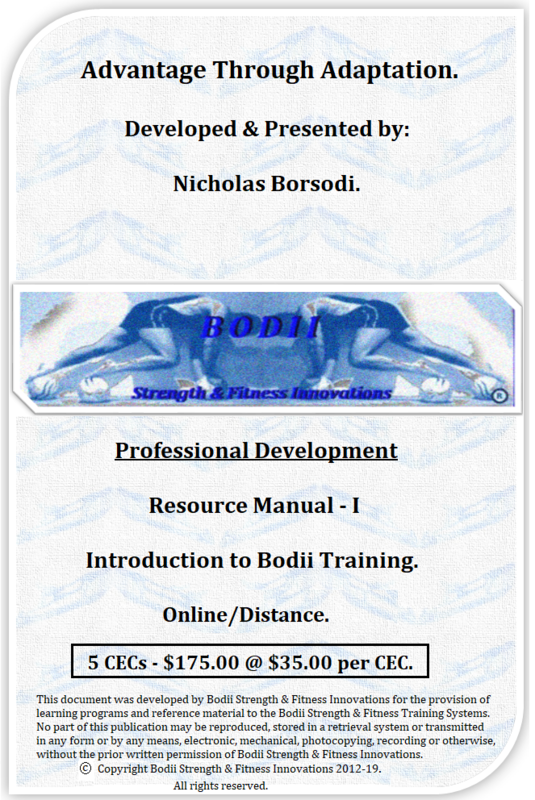 The introductory Bodii program which outlines and discusses in great detail the need for a review of current strength and fitness training practices. Practices that at present inevitably produce consistent chronic injury concerns due to the single minded approach of increasing resistances, without adequate assessment of whether further increases are appropriate. Contains a thorough explanation of alternative methods to advancing loads and the bodies principal centres of load absorption, distribution and the origin of movement. Principles demonstrated with the use of innovative and progressive load producing proprioceptive exercises. A Guide to the Bodii Programs. The need for a strength & fitness training alternative. The origin and development of Bodii. The anatomy of the core. Core strength versus core stability. The peripheral core and the muscles that stabilise hips and pelvis. 2. The active lumbar curve. 4. The included muscles of the peripheral core. The basic principles of Bodii. 1. The principle of specific instability. Specific Instability and the Weight/Load Differential at work. 3. The incidental and deliberate inclusion cycle. Preliminary considerations to basic Bodii exercises. Adaptive processes to core-ball exercises. Basic Bodii exercises using 25cm core-ball. 7. Core-ball adductor release and catch. Applying progressions of specific instability to some iconic strength exercises. The detail in Bodii progressions. 1. Anaerobic endurance - mountain climber progressions. 2. Strength - single arm row progressions. 3. Flexibility/mobility - calf raise/hamstrings stretch progressions. ​Preview of Bodii Program II.